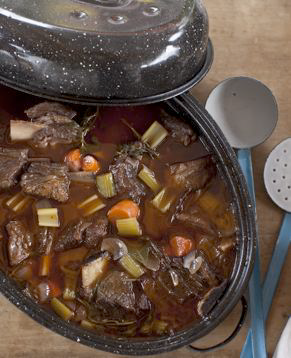 These short ribs are great to cook on the Thursday before going away for the weekend. The short ribs last for days in the refrigerator (in fact, cooling in the sauce makes them really juicy and tender). Then when I come back from a weekend excursion on Sunday night, a fantastic dinner is already waiting for the family. Arrange the oven racks so that one is right in the center and there will be enough room for a Dutch oven. 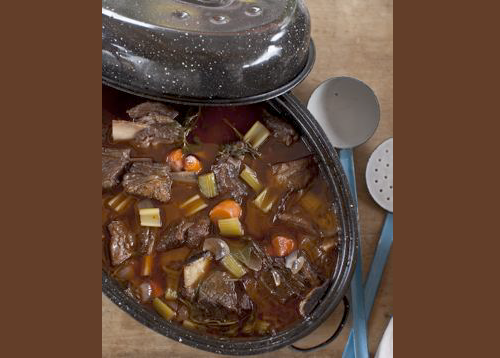 Heat the oil in a large Dutch oven or similar pot over high heat. several times until browned on all sides. You will have to do this in batches; do not crowd the pot. Transfer the ribs to a plate when they are browned. Add the celery, carrots, onions, and garlic to the pot. Add the flour and tomato paste . Cook for 1 to 2 minutes longer, stirring constantly. wooden spoon to scrape up any browned particles. Return the ribs to the pot. Add the thyme, bay leaves, oregano, and rosemary. Cover, and transfer to the center rack of the oven. Braise for about 2 1⁄2 hours or until meat is very tender and easily separates from the bone. Remove the meat and bones from the pot and arrange on a serving platter . Strain the sauce through a colander or large sieve into a large saucepan or bowl, pressing on the vegetables to extract as much liquid as possible. Bring to a boil over medium-high heat, skimming off any fat that accumulates on the surface. Reduce the heat to medium and cook for about 15 minutes or until the sauce is slightly thickened and its flavors intensify. Pour the sauce over the ribs, garnish with chopped parsley, and serve.